Nearing the date of the 2nd International Festival of Migratory Birds, which will be the 7th of March, we will be giving talks and going on excursions with students to motivate them to learn about birds and the importance of conserving them. 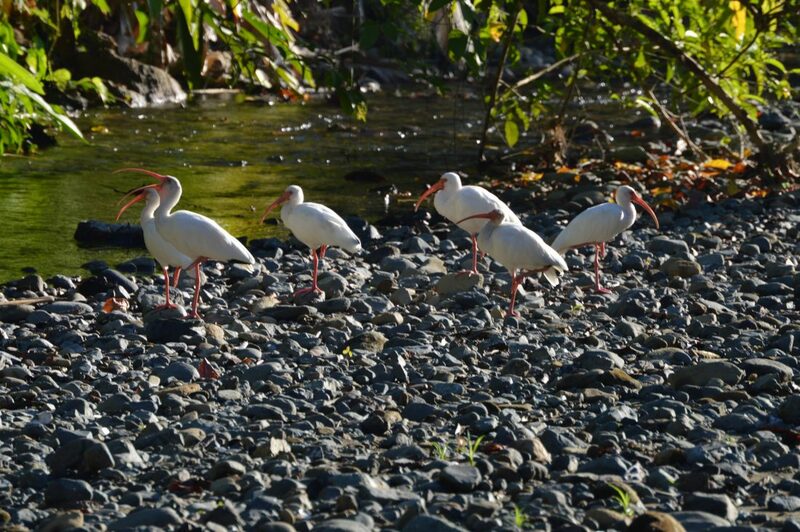 Together with the organization Osa Birds, we will walk with students on different trails with the objectives of learning skills in the use of binoculars and bird identification guides; learning to observe birds in their different habitats; and finally, identifying the most frequently observed species in the Puerto Jimenez area. 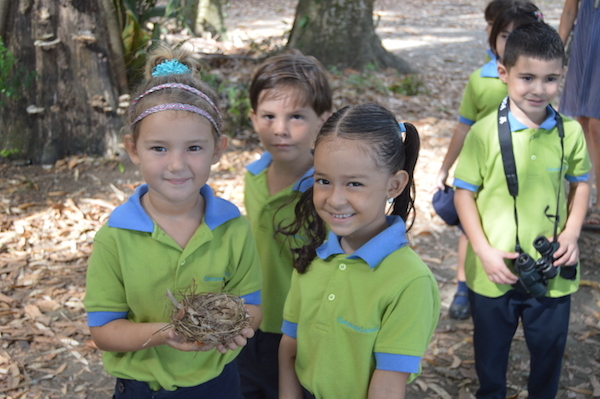 We’ll be going on our first hikes with Corcovado School, a private school with a major focus on increasing environmental awareness among its students. Ríos Saludables on the Road! Osa Conservation took its new citizen-science stream-monitoring network, Ríos Saludables de Osa, on the road in February for a community workshop in the San Josecito area south of Dominical. 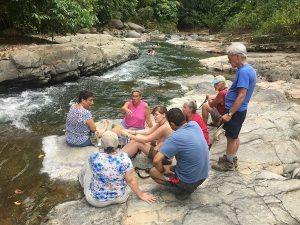 Over 35 community members including kids convened in the scenic watershed of the Rio Higuerón for a full day of ‘immersion’ in stream ecology and hands-on measurement of aquatic health. Claudia Alderman, a resident of San Josecito and member of our Osa Conservation Science and Education Advisory Committee, hosted the event. Activities were facilitated by Osa Conservation staff: Pilar Bernal (Environmental Educator), Erin Engbeck (Aquatic Research Field Assistant), and Jim Palmer (Science and Education Director), as well as recent UCR graduate Alejandro Muñoz (Biomonitoring and Ecotoxicology Lab). The morning session held in the San Josecito community center featured an introduction to the Ríos Saludables Network and hands-on practice in methods of basic analysis of water chemistry and bacterial coliforms. Residents had the opportunity to voice their concerns and personal passion for the health of their drinking water sources and beautiful streams in this mountainside community. Of special concern were instances of illegal harvesting of freshwater shrimp in the watershed and the potential impacts on overall stream health. 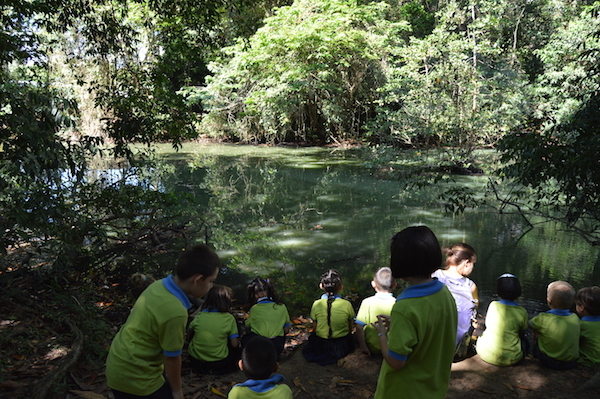 The afternoon was filled entirely with fieldwork from the banks of the beautiful Río Higuerón. Divided in to four teams, the group conducted replicate tests of basic water chemistry (temperature, dissolved oxygen, pH, conductivity, nitrates, turbidity, alkalinity), bacteria (E. coli), and stream biodiversity using kick-net samples. 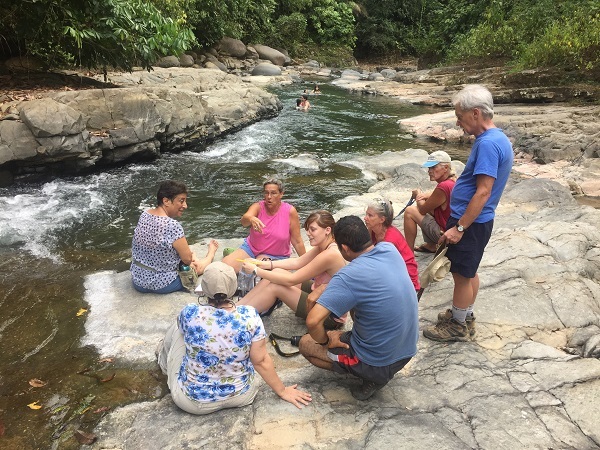 The soothing, cool water of the stream and natural waterslides did not escape the attention of these citizen scientists either! Results revealed a stream high in clarity and oxygen with strong influence from adjacent spring-fed tributaries. Kick-net samples detected 27 different taxa of freshwater macroinvertebrates with an ‘excellent’ score (exceeding 120 points on the BMWP-CR index of water quality. 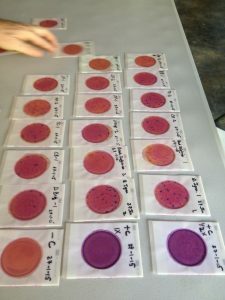 Especially important indicators of high water quality, the mayflies (Ephemeroptera), stoneflies (Plecoptera), and caddisflies (Trichoptera) were present in healthy numbers and multiple taxa. 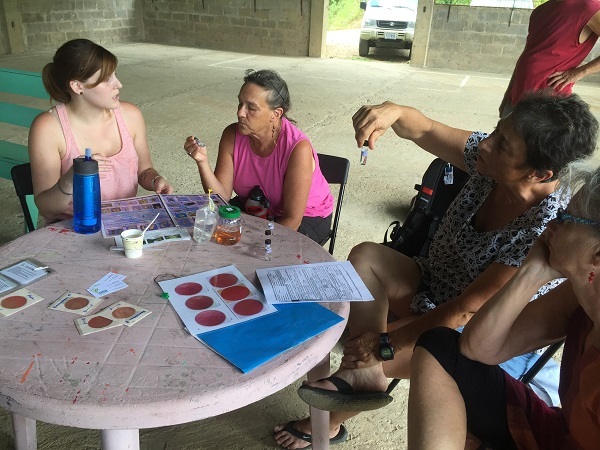 At the conclusion of a busy day, Jim Palmer presented the San Josecito community group with a complete water testing kit so they may continue to assess the health of their watershed on a monthly basis. OC staff will return periodically for future follow-up sessions to introduce the stream studies to local school classes. 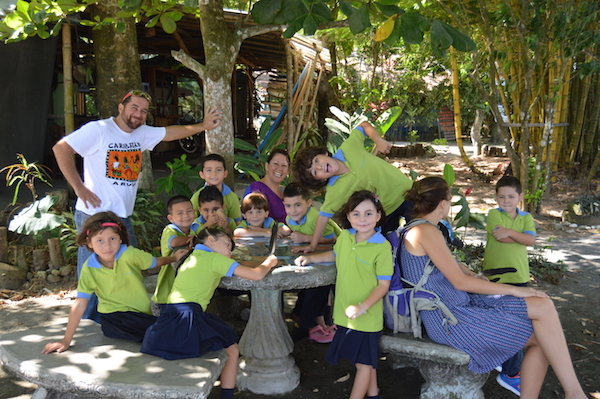 We invite the San Josecito community members and students to visit us at Osa Conservation for comparison water studies on the Osa Peninsula and partner with our local schools in Puerto Jimenez, Carbonera, Piro and Río D’Oro in this growing network. 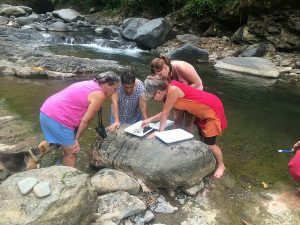 Ríos Saludables de Osa is a volunteer water-monitoring network for community members and schools of the Osa Peninsula and southwestern Costa Rica. Osa Conservation provides the organizing framework for the project with assistance from professional, government and non-profit agencies. Our purpose is to establish and sustain a network of community volunteers across the Osa region to conduct ongoing basic water quality monitoring. Data will be incorporated into an online Water Atlas for the ACOSA region and used to inform public health, watershed protection and conservation decisions. 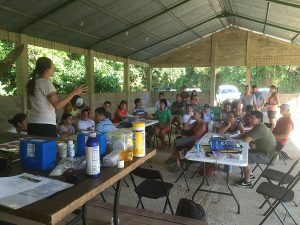 Initial organization of Ríos Saludables de Osa was made possible by the materials, resources and experience of our partner organizations: Georgia Adopt-A-Stream (Atlanta, GA, USA); Creek Connections (Allegheny College, USA); and Stroud Water Research Center (Avondale PA, USA). As the project matures, community volunteers and stakeholders will oversee organization and water monitoring activities of local groups. 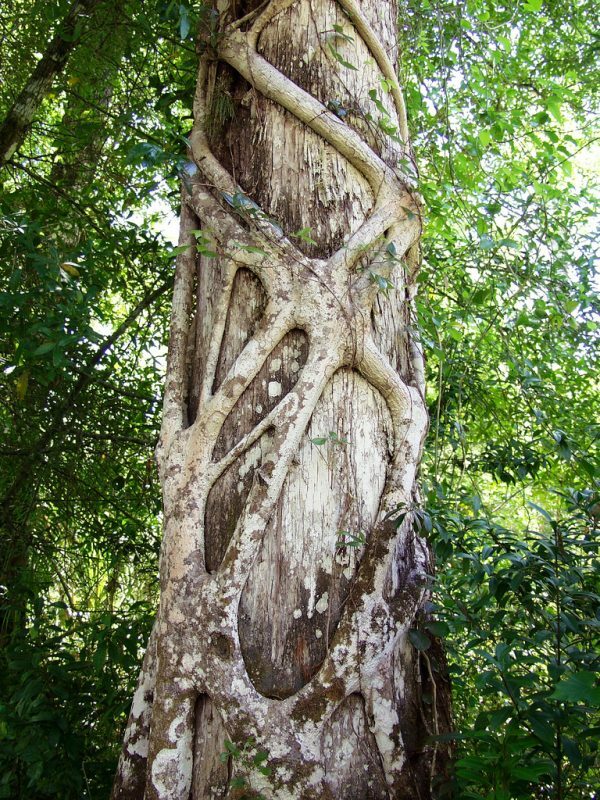 Strangler trees, mostly Fig trees, have evolved in a interesting way to take advantage of other trees for growing, especially in places where the thickness and canopy of the forest make scarce one of the most important elements in a plant’s life: light. 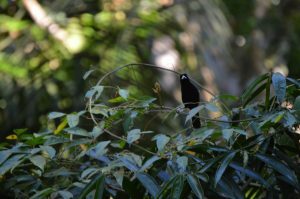 The Osa Peninsula, one of the most biologically intense places in the world has more than 700 species of trees and 3000 species of plants which, in terms of competition and survival, is a lot for a plant. Under the canopy, being a small tree is all about competition. Competing for water, for nutrients and for space, but mainly competing for light. 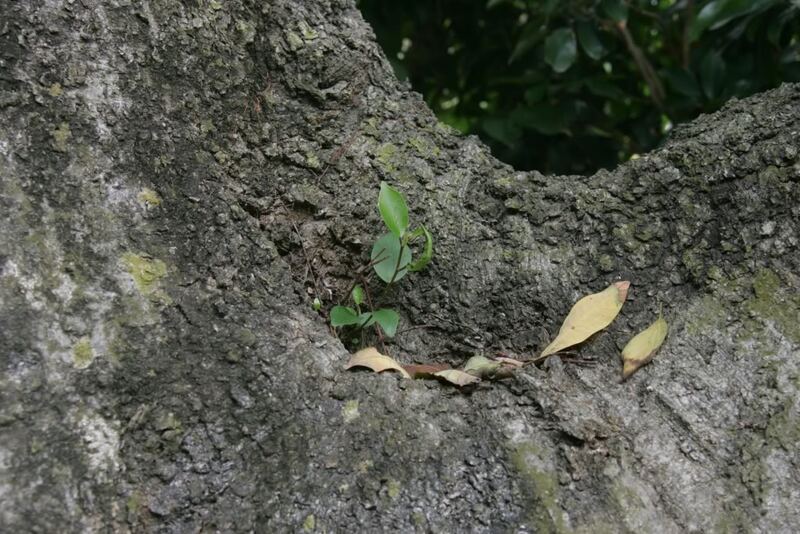 Whenever an old tree falls down or dies, automatically a gap is created providing light to new potential small trees. That is where the race for growing begins and only the fastest in growing will prevail. 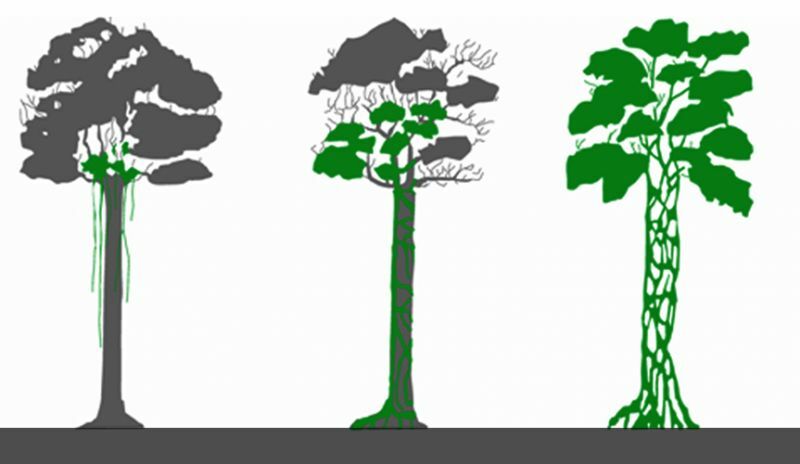 Interestingly, fig trees evolved for being able to compete with other trees but growing backwards. 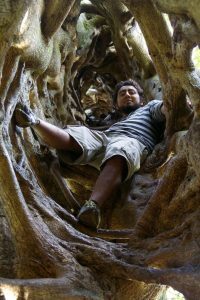 These plants begin life as hemiepiphytes, when their seeds, often bird-dispersed, germinate in crevices atop other trees. Strangler starting to grow on top of host tree. These seedlings grow their roots downward and envelop the host tree while also growing upward to reach into the sunlight zone above the canopy. 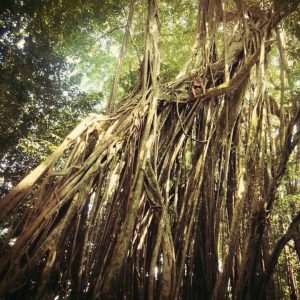 By having a different strategy, fig trees have been able to succeed in one of the most competitive ecosystems in the world reaching more than 20 different species in Osa. Strangler growing up as it embraces the host tree and reaches the ground with roots. Since they depend on the structure of the host, and they grow multiple roots for constant support, sometimes they achieve funny shapes. 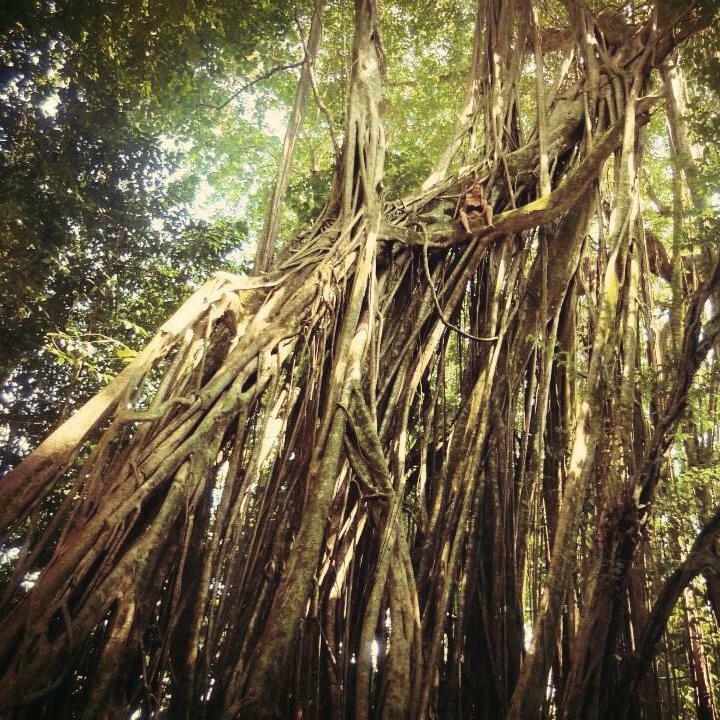 Huge strangler with multiple roots in Matapalo, Osa. Photo credit: Catharine Clukey. Once the strangler reaches the soil and becomes a big tree, the host starts dying since its resources become limited by this new tree, especially sunlight. After some years of being a strong tree and having a dead host, it is common to find fig trees that are hollow in the middle where the host used to be. Hollow fig tree after the host died in Monteverde, Costa Rica. Photo credit: Wanda von Bremen. 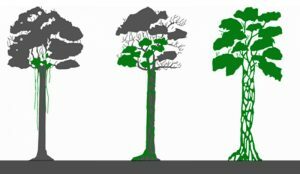 In the race for adaptation and survival, fig trees have had to evolve to get to the goal faster than hundreds of other species that competed with them by not following conventional procedures, such is the key of evolution, to explore ways that no one did before. 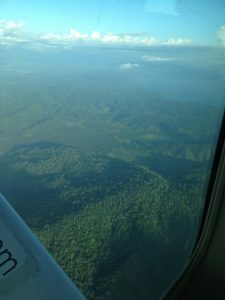 A few months ago it was suggested to me by my wonderful DC coworkers that I go down to the Osa Peninsula in Costa Rica, visit our field stations, and maybe, just maybe, consider taking a permanent role on-site volunteer coordinator. At first, as usually occurs with any life-changing event, I was slightly skeptical. Sure, I had worked for Osa Conservation for over a year, supported it’s projects, and had a deep rooted fascination with being able to work “in the field,” but I had also lived most of my entire life in the Washington DC area. I had my friends, my life, my work, and my beloved dog to think about. Well as it turns out, as some of you may have read in my previous blog post, I did end up going down to the Peninsula to investigate this idea – and in case it’s TL;DR – I fell in love . As I write this now, I have officially been here in Costa Rica as a permanent employee for less than a week since my arrival at 7 pm on Monday. Already though, I can safely say I’ve made the right choice. 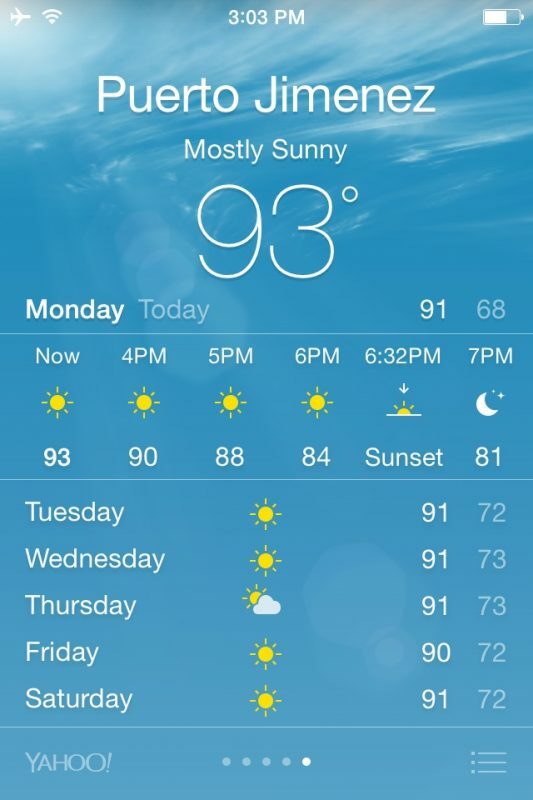 So how do I know that I’ve made the right choice having only been here for 6 days? Well…allow me to present an assortment of photos, each with captions, of how already in less than a week I have accomplished more a than I would in a month in otherwise – and for the record, I have not been resting and vacationing about as I promised myself I would do this first week, I have been working. And full 8 hours, too! Day 1. On 5 am Monday morning I arrived at WAS airport – as some of you may (or may not) know Blizzard Juno (the snowacolypse that could have been) came around the East Coast at that time and stranded (for no reason) some 1,000 or so flights. As it turns out, my 6 am flight to Florida was not one of them. A good sign, I’d say. 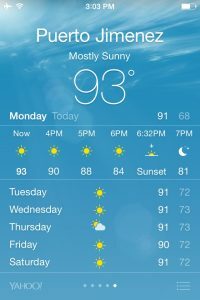 I arrived in San Jose in the evening and the weather read wonderful. From Blizzard Juno to 90 degree weather? Yeah. I made the right choice. That evening I set up my room, unpacked, and went to bed rather fast. 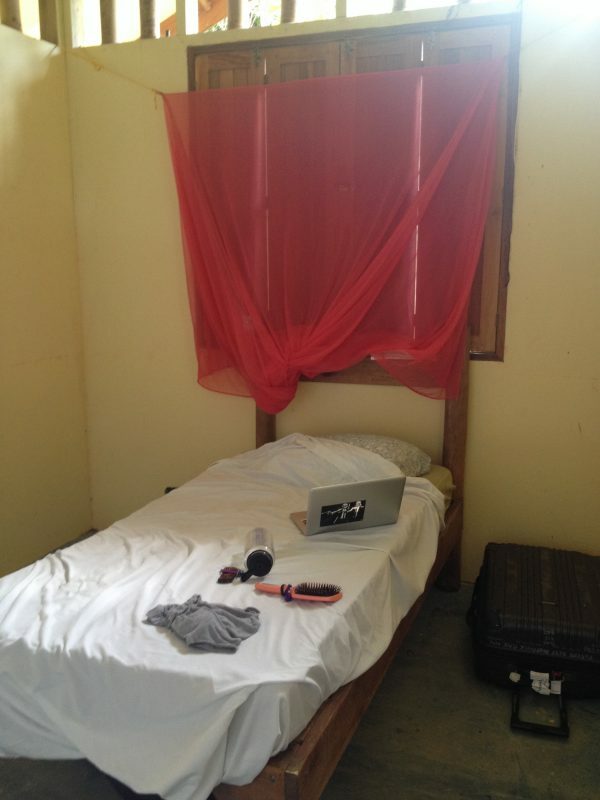 I didn’t even hang up my mosquito net. Day 2. A pretty normal day, it was almost too normal, as I worked on arranging some itineraries, usual stuff, but I also learned to ride a motorbike for the first time. Yeah. It literally happened just like that. I was sitting in the common area of the staff house minding my own business, and my co-worker looks at me and says, “Do you want to ride my motor bike.” The answer is Duh – that sounds horribly unsafe and wonderful. So I rode my first motorbike, and only fell twice as gracefully as a cat! (Picture Here) I blame the bike, it was heavier than me. Day 3. I’ve noticed that right around here time is already starting to matter less than it does in the chaotic world of catching subway trains, commuting for hours to work, and meeting people at set hours in set locations. I went and did some stream monitoring with our Science Director, Jim Palmer, and his assistant, Erin, and lets face it, if my job entails walking around sampling streams every now and again, then…it’s hardly a job, I’ll consider this a perk (this is what happens when you spent 4 years studying marine biology I suppose). I wrapped up my day with a bit more work and even managed to hang up my mosquito net. Day 4. At this point I already have to go back and look at the photos of my week to keep everything straight. I was invited to accompany our feline investigator, Juan Carlos, and our CEM, Wanda, to a local ecolodge that hosts talks about the local Osa Peninsula wildlife monitoring programs. It was quite a nice experience, and after we began to leave we had a wonderful encounter with a curious snake. As we all lazily hopped into the truck, Wanda so calmly and gracefully says, “Gee, uhm. You know Juan Carlos, if by any chance you could maybe slow down a bit, I think there may be a snake crawling in through the window…” Yes. There was a snake. 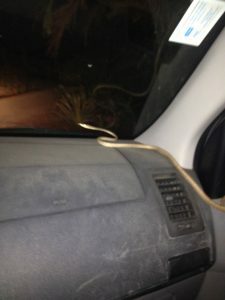 I confirmed from the back seat that I could see it, and I even managed to take a video of the whole ordeal, but long story short, the snake crawls into the car, slithers past the dashboard, wraps around the steering wheel, and decides to calmly exit the vehical via the driver side door. It was all rather entertaining to watch from behind, but more importantly I learned about the Oxybelis aeneus snake, that that this little (long..) guy is non-harmful to humans. Just a friendly, curious car snake! Day 5. 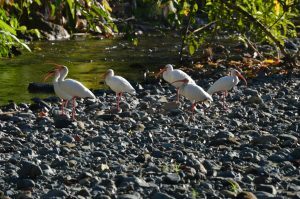 I have adjusted so easily that I woke up at the crack of dawn around 5:00 and hiked the Piro river by my house until 8:00, just in time to go to work…This hike was particularly calm, and I managed to snap some pictures of birds. I saw a striking Cherries Tanager and a large flock of Ibis. Another productive morning. Just a Cherrie’s tanager (Ramphocelus costaricensis), minding his own business. But now the real work begins, and as I prepare for all the groups and events, I also have a rather large smile on my face knowing that every day will be full of new adventures and, well, isn’t that’s what life is all about?